A generation on and a lot of the descendants of the original families still live in Seatown. 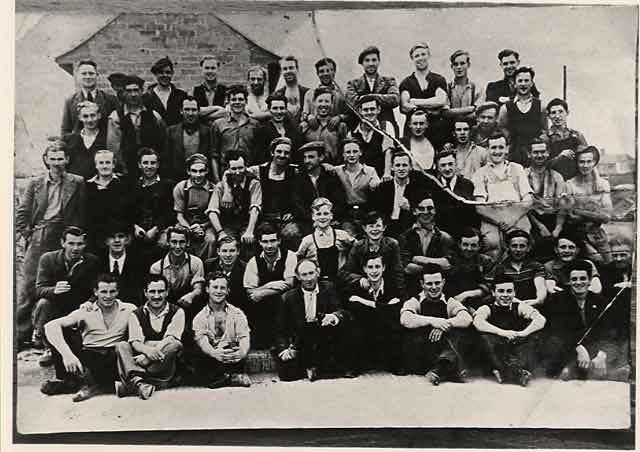 The photo above was taken of the building workers who built Seatown in 1949. Click to enlarge photo. if you recignise anybody in the image email me so I can place their names here. Built in the mid. 1960s - Dublin County Council. A settled estate with approx. 170 houses. Green space and bus stop on Rathbeale Rd. just outside Glasmore. Local shop and close to J.C.s supermarket. Built in the early 1970s - Dublin County Council. Approx. 300 houses, large green space, local shop in the estate, close to bus route and Manor Inn pub. Built in 1975 Dublin County Council. Beside J.C.s shopping center and well serviced by Dublin Bus. About 150 houses. Built in 1981 Fingal County Council-Armagh Construction. Another well settled housing estate with about 150 houses, beside bus route and shops including Dunnes Stores and J.C.s shopping center. Built 1990 by Fingal County Council, Armagh Construction. About 150 houses. Nearest shop 500 meters, close to Swords Main Street. Jugback Lane, built around 2002. About 100 houses, close to Applewood Village and shops. 10 min. walk to Main Street.